Today was my first day on the new job. This morning when I crawled out of bed at 5:30a.m. I really wondered "Wow, how am I going to make it through the day?!?" I was pretty nervous. I find first days on a new job to be like the first days of school. You plan an outfit. You never know who you're going to see and your not 100% sure what you're going to be doing. Once I got to work and was about half way through the day I knew it was going to be good. Tomorrow will be different today because we're doing different things. I actually smiled and enjoyed my work. I think I'm really going to love this job. Oh, someone asked me what type of job was it. It's a government job. I work for the Department of Homeland Security. 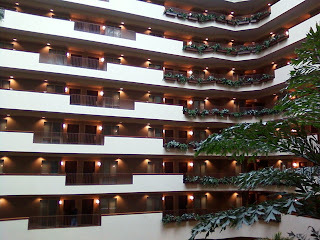 Remember the awesome hotel I talked about staying in. Here's a picture of what the inside looks like.... It opens up into this huge atrium. I'll take more pictures later. Easter was really good! I got a great Easter basket from my mother that included an iflip. I was very excited. Being a fat kid at heart...I ate way too much ham lol. first: I'm jealous.. .I want a government job! :( BOOO! Yeah you look like a Goverment lady, all blonde, classy and mysterious looking Like the girls in movies that play goverment workers but are secretly spys:p Ha ha, so glad you got to talk to your hunny! That time difference over there sure is a bugger! Yay! Glad you had a good first day...and got to talk to the man on top of that. Hope tomorrow goes as well! Haha, I totally ate too much Easter junk! Yay for the iflip though! I'm glad your first day went well! good luck on your new job!! one of our friends worked for homeland security here in KY for a while. she loved it!! Are we up or are we down? Dogs & Pirates. Oh my!